At a comfortable pace, this course employs a broad array of exercises to assist the beginner in understanding the basics of drawing which includes contour, proportion, mass, volume and tone. Different elements of drawing are examined in relation to a variety of objects, such as plants, rocks, prints and architectural forms. The class takes its inspiration from the famous beginners' drawing course formulated by the eminent Victorian draughtsman and art critic, John Ruskin. Suitable for beginners to intermediate. Using an image of a leaf, a sheet of tracing paper provided, will be placed over the image and traced. Placing the tracing paper on a new sheet of paper, students will mark multiple points to indicate the leaves perimeter. Looking back at the original drawing, students will then fill in the spaces between these points with the remaining contour of the leaf’s outline, as accurately as possible. We will then apply the exercise to living plant specimens. This exercise introduces the student to the fundamentals of observation and contour, while also putting the student at ease in fostering a habit of erasure and correction. See John Ruskin, The Elements of Drawing Exercise 2. Shading Exercise: We will begin the class with an exercise in shading. Between two parallel lines, students will take great care to shade as carefully and as softly as possible, from left to right, from the darkest gradation of the pencil to its lightest. The aim of this exercise is to produce a seamless ascent in tonal gradation. See John Ruskin, The Elements of Drawing Exercise 3. Silhouette Study: Using the image of a tree, students will shade in the form of tree branches and foliage without the initial use of outline. The aim of this exercise is to ultimately gain an intuitive proficiency at determining the parameters of an object’s volume. Students will make continuous use of the eraser to refine the contours of their silhouette. Once the contour of the silhouette is described as accurately as possible, pen and ink will be used to delineate the contours of the branches and their overlapping forms. See John Ruskin, The Elements of Drawing Exercise 6. Rock Study: Students will bring an assortment of small round rocks and a torch into class. Shining the torch onto one of the rocks, students will employ an assortment of cross hatching to suggest the rock’s form. This will be repeated using a variety of different rocks and by altering the direction of the light source. See John Ruskin, The Elements of Drawing Exercise 8. Foliage Study: Students will bring a spray of any foliage from home and a jar for support. As time permits, a variety of contour drawings of foliage will be undertaken at eye level, ground level and at varying distances from the student. These will be carefully coloured in with brush and ink. The aim of this exercise is to observe how the leaves of a plant appear at both different angles and distances. This is an invaluable lesson in comprehending how a particular plant species looks at different heights within the landscape and the degree to which we are able to see the shape of foliage at various distances. See John Ruskin, The Elements of Drawing Exercise 10. In this exercise, we will focus on a section of a landscape print, in order to both observe and replicate its use of line, hatching and shading in the depiction of distant foliage. This practice will help us gain an understanding of how artists communicate the ephemeral characteristics of the landscape at greater distances. The exercise will then be applied to photographic images of distant trees and foliage. See John Ruskin, The Elements of Drawing – an elaboration by Ruskin on Exercise 10. We will look at how to reproduce an architectural detail by contour alone, addressing its overarching geometric forms and the relationship of subsidiary forms to this shape. The role played by the fall and direction of light and shadow will be taken into account. We will study another architectural ornamental detail, addressing the formal qualities discussed in the previous class within the context of introducing both black and white chalk on a mid-toned paper. In the final two weeks we will look at nine principles for composition as they relate to composing images: dominant mass, repetition, continuity, curvature, radiation, contrast, reciprocation, consistency and harmony. Gain an understanding of and an ability to put into practice some of the fundamental elements of drawing. 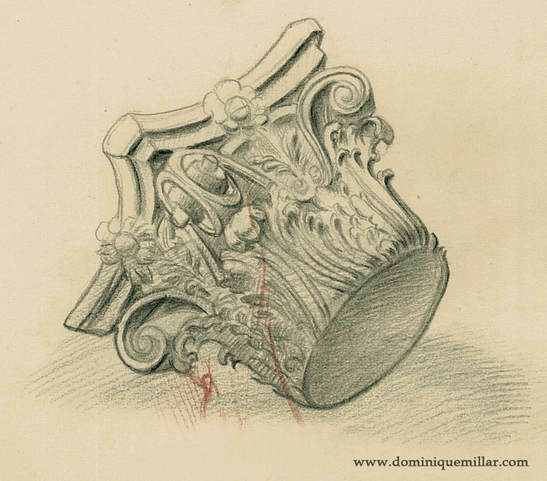 Learn to observe form, tone and volume in any object. Make use of and identify useful prints, drawings,photographs and other images as teaching aids in learning to draw. Gain an understanding of the relationship between natural shapes, decorative design and architectural forms. Gain the conceptual background to compose an image. Stanley knife for sharpening pencils.